Click above to view the flyer for this event. 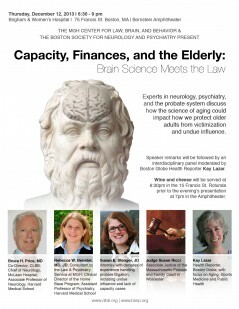 On December 12th, 2013, at Brigham and Women’s Hospital’s Bornstein Amphitheater, CLBB joined forces with the Boston Society of Neurology and Psychiatry to host a conversation among experts in neurology, psychiatry, and the law about how the science of aging could impact how we protect older adults from victimization and undue influence. Where do we draw the line between protection and paternalism? What constitutes a bad financial decision? Who needs additional protections? Panelists included Bruce H. Price, MD, Chief of Neurology at McLean Hospital and Co-Director of CLBB; Rebecca W. Brendel, MD, JD, Consultant to the Law & Psychiatry Service at MGH, Clinical Director of the Home Base Program, Assistant Professor of Psychiatry, Harvard Medical School; Susan Stenger, Attorney with decades of experience handling probate litigation, including undue influence and lack of capacity cases; and Judge Susan Ricci, Associate Justice of the Massachusetts Probate and Family Court in Worcester. Kay Lazar, Health Reporter at the Boston Globe with a focus on Aging, Sports Medicine and Public Health, moderated a panel discussion and Audience Q&A following the speaker remarks. To watch video from this event, visit our Vimeo channel on Capacity, or watch individual segments below. Also, read Kay Lazar’s story about this topic and CLBB’s role in the Boston Globe. Judy Edersheim and Kay Lazar introduce “Capacity, Finances, and the Elderly” from Center for Law, Brain & Behavior on Vimeo.